The Collared Owlet is a tiny owl with a rounded head and no ear-tufts. 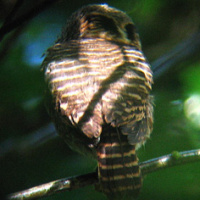 It is also known as the Collared Pygmy Owl. Description: The face is pale brown with well-defined white eyebrows. The eyes are pale lemon-yellow or straw-yellow to golden-yellow. The bill is greenish-yellow with a darker base, while the cere is greenish to bluish. The chin is white, there is a prominent white moustachial streak, and the throat has a large white patch. The upper breast has a greyish-brown, pale-spotted pectoral band. The crown, nape, ear-coverts and the sides of the neck are dull grey-brown or reddish-brown, marked with broken bars and spots of whitish-fulvous or rufous of various shades. There is a broad fulvous or buffish half-collar on the hindneck, with black bases showing through and forming a black patch on each side of the neck (false eyes, or occipital face). The rest of the upperparts are brown or greyish-brown, barred whitish-fulvous. The scapulars have white outer webs, forming a bold streak across each shoulder. Primaries are blackish-brown, barred with white or buff. The tail is dark greyish-brown to dark rufous, and densely marked with whitish to reddish-buff bars. Underparts are white, fulvous-white, or rufous-white with broad dark brown bars on the sides of the breast and flanks, which become fewer and more drop-like on the lower flanks. Overall colour is quite variable. Legs and toes are pale greenish-yellow to olive-grey, with the soles paler and more yellow. Claws are dark horn. Size: Length 15-17cm. Wing length 80-101mm. Tail length 56-71mm. Weight 52-63g. Females are usually heavier and larger. 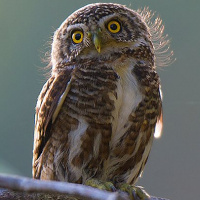 Habits: The Collared Owlet is diurnal and crepuscular. They are usually seen perched on a sparsely foliaged branch in a tall forest tree. They commonly fly about, and even hunt and call during the day, despite mobbing by smaller daytime birds. Flight is a series of rapid wingbeats alternating with gliding. Voice: The song of the male is a pleasant four-note whistle repeated at intervals of several seconds - wup-wuwu-wup, wup wuwu wup. Phrases are often incomplete, and just end in wuwu. While singing, this owl bobs its head from side to side, producing a ventriloquial effect. This, combined with the bird's habit of starting the song softly, and gradually becoming louder, makes it very difficult to locate. 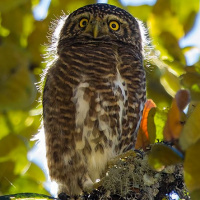 Hunting & Food: The Collared Owlet feeds mainly on small birds. They will also take mice, lizards, cicadas, grasshoppers, beetles and other large insects. This owl has been known to take birds almost as large as itself, carrying these off to a perch in its talons to tear up with upward pulls of the bill. Breeding: Not well known. In the Himalayas, breeding season can be from March to June but is usually in April and May. The nest is usually an unlined natural tree hollow, or a barbet or woodpecker hole 2-10m above the ground. The chosen tree is often very rotten, and stands in a fairly open place in the forest, or in a clearing. The female lays 3-5, usually 4, white roundish eggs, around 29 x 24mm. Habitat: Usually submontane and montane forests with open spaces, clearing and forest edges; woodland with scrub. Ranges from about 1350-2750m elevation, locally even higher. In China, they have been recorded near cultivated land at about 700m elevation. 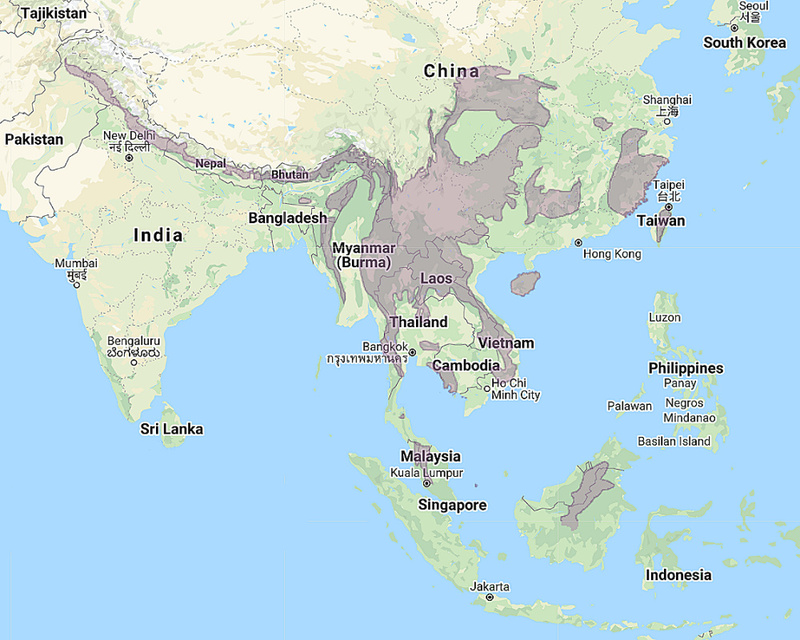 Distribution: Himalayas from northern Pakistan, east to China and Taiwan, south through Malaysia to Sumatra and Borneo. Original Description: Burton, Edward, M.D. 1836. Proceedings of the Zoological Society of London (1835) (PZS): Pt. 3, no. 34, p. 152. 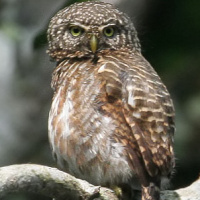 See also: Other owls from Asia, Genus: Glaucidium. Page by Deane Lewis. Last updated 2015-11-16.